Buildbase Suzuki rider Richard Cooper will make his road racing debut at the fonaCAB International North West 200 in association with Nicholl Oils on May 12-18. 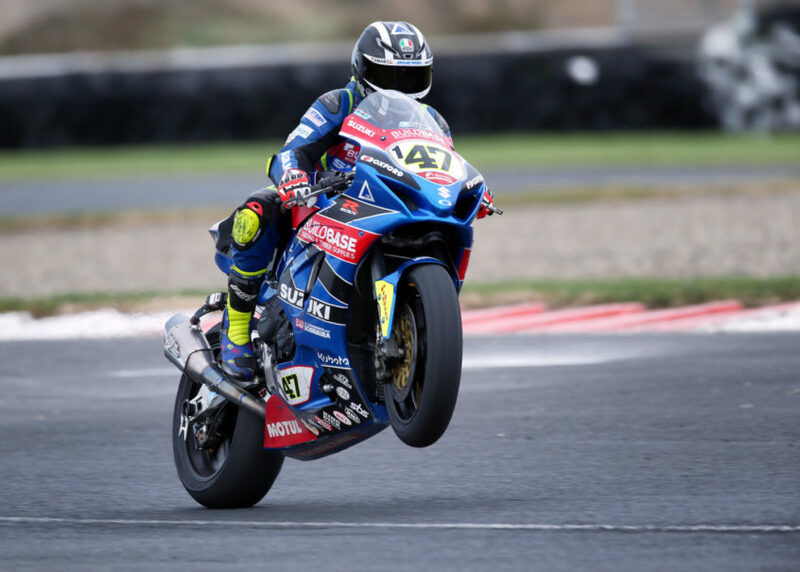 Securing the entry of the factory supported Suzuki rider aboard GSXR1000RRs in the Superbike and Superstock races is a major coup for the NW200 organisers as the event celebrates it’s 90th birthday in 2019. ‘I have a lot of experience in bike racing but road racing is the one big thing that I haven’t done.’ Cooper explained after visiting the North West 200 circuit last week. The 35 year old was the winner of the final race in last year’s BSB showdown at Brands Hatch. He recently impressed local race fans by winning all three superbike races, including the feature event, at last October’s Sunflower Trophy meeting at Bishopscourt. Cooper will ride a Buildbase Suzuki in the 2019 British Superstock series. ‘Riders say road racing is like a drug but I won’t know until I try it whether or not I will be addicted.’ Cooper smiled. Steve and Stuart Hicken’s Suzuki squad fielded Michael Dunlop at the 2017 North West on a GSXR, providing Cooper with base settings for this year’s challenge. The Nottingham rider has already completed several sighting laps of the famous 8.9 mile Triangle circuit with 8 times North West winner, Steve Plater. ‘The team are right behind me and we have already spoken about who will be in our North West 200 crew.’ the 2011 British Superstock champion said. The Nottingham rider will line-up up alongside NW200 regulars Glenn Irwin and Alastair Seeley in the British championship trio’s only road race outing of 2019 but refuses to be drawn on his ambitions. ‘I’ve raced and beaten those boys before so maybe they will see me as a threat.’ he smiled. ‘It is very exciting to have a BSB rider of Richard’s ability and experience making his road racing debut at the North West.’ Event Director, Mervyn Whyte, MBE, said. 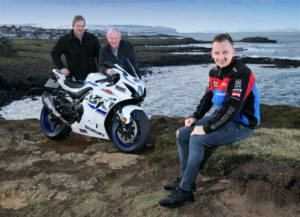 PACEMAKER, BELFAST, 1/2/2019: Buildbase Suzuki BSB rider, Richard Cooper, who will make his debut at this year’s fonaCAB International North West 200 in association with Nicholl Oils pictured on the North coast with Clerk of the Course Stanleigh Murray and Event Director, Mervyn Whyte.